When Monique, a young visiting nurse, steps into the home of an elderly patient, she finds herself in rooms filled with the most vivid color she has ever seen. 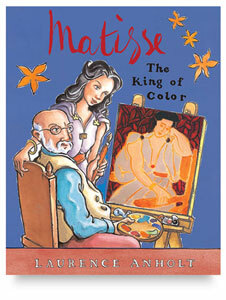 Her patient is the artist Henri Matisse, and as Matisse recovers from his illness, he and Monique become good friends. Later, Monique enters a convent where she becomes a nursing nun — and by happy coincidence, she meets Matisse once again. Her religious order is so poor that it doesn’t have a chapel of its own, but Matisse decides that with Monique’s help, he can remedy that situation. He develops a sketch drawn by Monique into a brilliant set of stained-glass chapel windows, and then uses his influence to raise enough money for the chapel’s construction. This true account of Matisse and the chapel at Vence, in southern France, is the main focus of Laurence Anholt’s delightful children’s story. Anholt’s illustrations faithfully reproduce many of Matisse’s wonderful artworks in this stunning storybook. Laurence Anholt is a British writer and illustrator whose books for children include Van Gogh and the Sunflowers, Degas and the Little Dancer, The Magical Garden of Monet, and Picasso and the Girl with a Ponytail. Anholt’s popular books for children have been published in 15 different languages, including Cantonese, Hebrew, and Icelandic. As both an author and an accomplished illustrator, he has created a charming series of children’s stories about famous artists. He and his wife, Catherine, both successful authors of juvenile titles, have three children, from whom they obtain many of their story ideas. They live and work in Lyme Regis, Dorset, England. Appropriate for children ages 4–8. Hardcover. 32 pages. 9" × 11½" (23 cm × 29 cm). ™ Barron's is a trademark of Dow Jones & Company, Inc.